So, exciting, I’ve just put my kiln on to fire some pots for the first time in 3 years! Hope it works. I will show you the results! This entry was posted in Uncategorized on November 26, 2013 by louise. Cripes, I last posted in August. The time is flying. Christmas is coming! 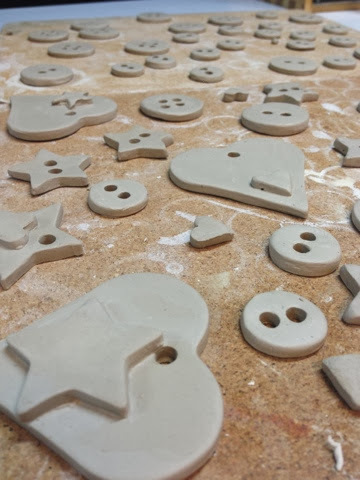 Just thought I’d post a pic of my soon to be funky buttons and christmas tree decorations. To the kiln they will go. This entry was posted in Uncategorized on November 18, 2013 by louise.